By way of introduction to our company, we are a premier weapons manufacturer located in Black Creek, GA near Savannah. We currently are the sole source provider for free float hand rail systems for SOCOM, the US Army Marksmanship Unit, and the British UK Ministry of Defense L-85 platform. Our rail systems are known throughout the industry as having the best strength to weight ratio, and our hand rails have the slimmest profile on the market. In short, we offer a lighter, stronger, slimmer product that gives the end user more control and accuracy. Our commitment to excellence is paramount, and we back that commitment up with a lifetime guarantee on all our products. In January, we introduced our M4 rifle to the market, and we have received nothing but accolade in response. The personal feedback from distributors, dealers, and end users has been very positive, and the blogs and tactical publications have been echoing that sentiment. David Kenik just gave us a great write up in Guns and Ammo The book of AR 15. 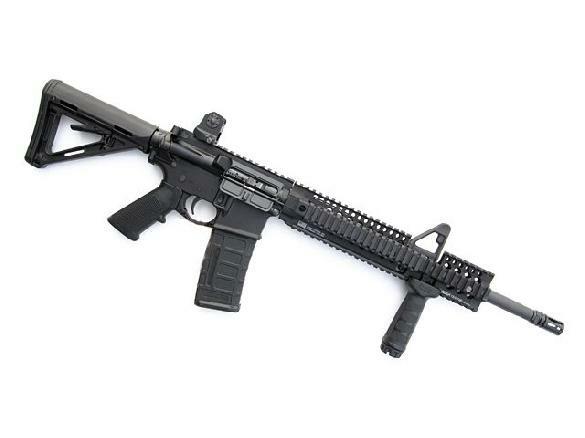 Description Daniel Defense is proud to announce the unveiling of our long anticipated M4 Carbine! This milestone marks the culmination of nearly a decade of dedication by Daniel Defense. Every aspect of this rifle was engineered with the tactical professional and shooting enthusiast in mind. Built to redefine the benchmark in small arms performance, this precision-crafted firearm will perform faithfully in any Military, Law Enforcement, Homeland Security, and Home or Personal Security Environment. Materials & Construction Precision crafted from the highest quality material available today with meticulous attention to detail, The Daniel Defense M4 Carbine will prove to be the benchmark in the industry. * Lower Receiver: Mil-Spec with Enhanced Flared Magazine Well * Upper Receiver: Mil-Spec with Indexing Marks and M4 Feed Ramps * Barrel: 16″ Ordnance Grade 4150 MP Tested, Chrome Lined, 1:7 Twist, M4 Profile * Chamber: 5.56 NATO * Flash Hider: A2 Birdcage Flash Hider * Bolt Carrier Group: Mil-Spec MP Tested, Properly Staked Gas Key * Sights: Daniel Defense A1.5 Fixed Rear Sight; Pinned “F” Marked Front Sight Base * Rail System: Daniel Defense Omega X 12.0 FSP * Buttstock: MAGPUL MOE Buttstock & Mil-Spec 5 Position Receiver Extension * Magazine: MAGPUL 30 round PMag in Black * Vertical Grip: Daniel Defense A2 Styling Vertical Grip * Case: Comes with Custom Daniel Defense Full-Latch 30ft Impact Plastic Case * Made in the USA! Warranty Statement	The Daniel Defense M4 Carbine carries a 100% satisfactions guarantee against defects in original materials and workmanship. If your Daniel Defense M4 Carbine shows evidence of such defects, Daniel Defense will make every accommodation to fix, repair, or replace your firearm in the most expeditious and inexpensive manner possible. Daniel Defense does not warranty products or damage caused to our products by the correct or in correct installation of other manufacturer’s products. Be sure to retain your sales slip as proof of purchase date when making a claim.